Darvill, Timothy 2002. ‘It's better to dig than dance’: archaeological method and theory in ANTIQUITY 1927 – 2002. Antiquity, Vol. 76, Issue. 294, p. 1094. Benson, D. 1973. A sites and monuments record for the Oxford region, Oxoniensia, XXXVII, 226–37. Benson, D. and Miles, D.. 1974. 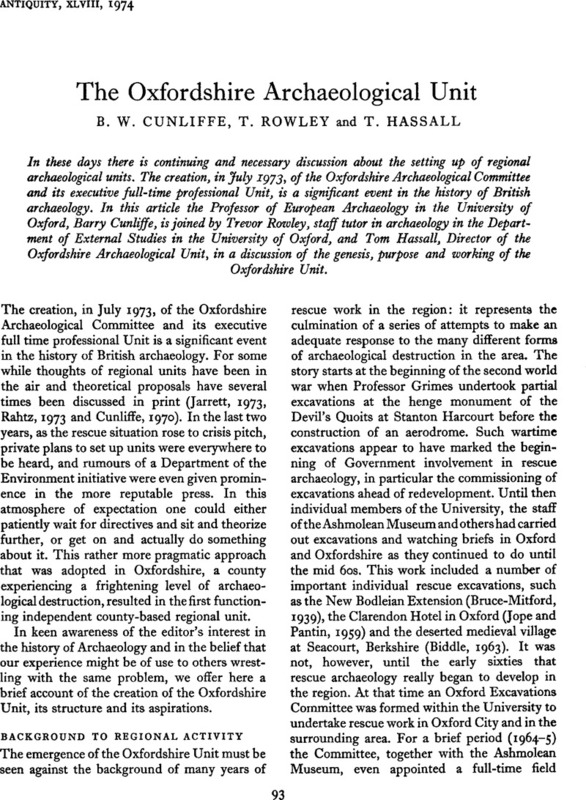 The Upper Thames Valley: an archaeological survey of the river gravels (Oxford). Biddle, M. 1963. The deserted medieval village of Seacourt, Berkshire, Oxoniensia, XXVI-XXVII (1961–2), 70–201. Bruce-Mitford, R. L. S. 1939. The archaeology of the site of the Bodleian extension in Broad Street, Oxford, Oxoniensia, IV, 89–146. Cunliffe, B. W. 1970. The past tomorrow (Inaugural lecture delivered at the University of Southampton 1969). (Southampton). Jarrett, M. G. 1973. A revolution in British archaeology? Antiquity, XLVII, 193–6. Jope, E. M., and Pantin, W. A., 1959. The Clarendon Hotel, Oxford, Oxoniensia, XXIII (1958), 1–129. Rahtz, P. 1973. What kind of Regional Units do we need? Rescue News, 4 (Summer 1973), 2–5.